Chester choir Handbag of Harmonies were among the line up at Chester’s inaugural WOW Festival. The city’s brand new £37m Storyhouse cultural has played host to what is the North West’s first ever such event. WOW Festival started at Southbank in London and is now a global festival, aiming to combine discussion, debate and celebration, while striving to achieve equality for all. There have been a wide variety of talks, and entertainment, including a WOW bites session looking at various community and charity initiatives, film screenings, a dance like Beyoncé workshop and a panel discussion on breaking the glass ceiling. Among those performing was Chester choir Handbag of Harmonies, led by Chester composer, musician and theatre director Matt Baker. Here is a video, giving a taster of the choir’s performance in the foyer of Storyhouse, which resulted in standing room only for those keen to soak up every last second of each song. It was a breathtaking performance as part of a thought-provoking and inspirational weekend of WOW Festival events. Well done to all those who have worked so hard to bring this to Chester. It is wonderful to see Storyhouse coming into its own with such a wide variety of homegrown and community events, which also included a barnstorming gig from Chester indie three piece Peaness – the first band to headline at Storyhouse. Keep ’em coming Storyhouse! 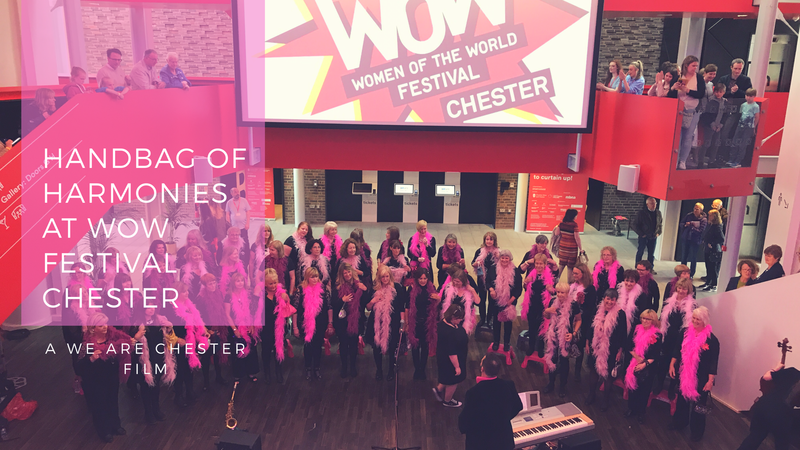 Watch out for more from WOW Festival, since our writer Meg Chester was part of the team behind this major event and she will be telling us all about her experience soon.